The Overland Telegraph Line - proposal to pass through Queensland. Many early discussions about a possible cable from England to Australia focussed on a landing on the Australian continent somewhere in Queensland. A number of places were considered over the following years. 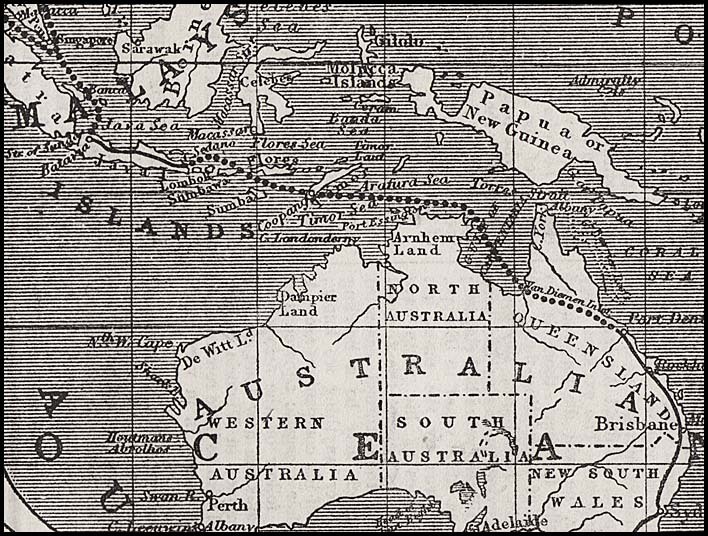 1859 map of the Australia and China Telegraph. Unbroken red lines are existing lines in 1859. Dotted lines are lines proposed or in progress (1859). Lithographed at the Crown Lands Office, Melbourne Nov. 3 1859 by James B Philp. In his 1869 Report to Parliament, Cracknell noted that greater detail was by that time available and that a telegraphic route could be then considered to Queensland. A report on this proposal was also published in the Brisbane Courier of 29 June 1869. Such a route had been considered for some years and was published in 1865. Telegraph Map of the Eastern World (part). The Illustrated London News, July 8 1865, p. 4. A second suggestion for cable link was from Batavia via Timor to the Gulf of Carpentaria and then overland from Normanton (Van Diemens Inlet) to Port Denison (Cardwell) and south to Brisbane and Sydney. This suggestion was the main one and supported until the actions of South Australia in 1870. THE BRITISH AUSTRALIAN TELEGRAPH COMPANY. "Who would have suspected six years ago that the Northern Territory would be brought into direct communication with London before it had even a half-yearly mail from Adelaide? But so it will be unless the Government are inclined for a little competition with the British Australian Telegraph Company. This association, organised by Captain Sherard Osborne, has pledged itself to land a cable at Port Darwin in 1871. Our embryo settlement will then become the terminus of a telegraphic route connecting Australia via Singapore via Java and Timor. The scheme is manifestly a combination of those originally advanced by Captain Osborne and Mr. Fraser, the agent of the Queensland Government. 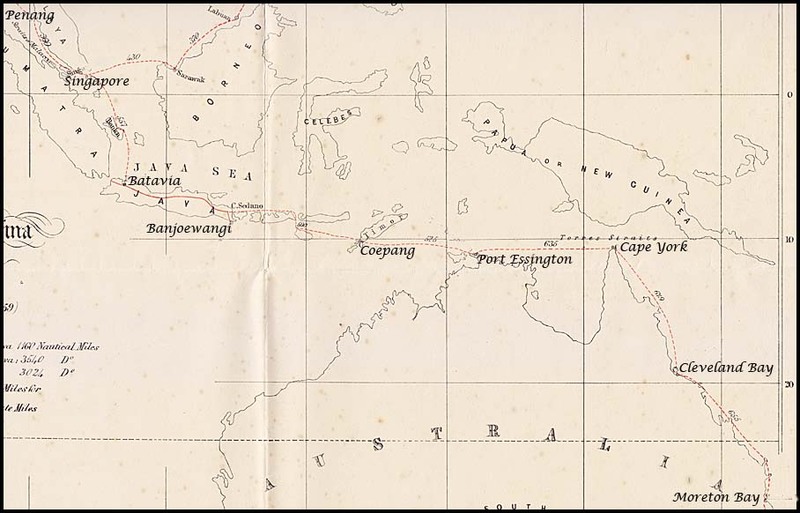 One of Captain Osborne's proposals, transmitted through Mr. Verdon to the Victorian Government, was to connect the Indian and Dutch lines via Rangoon and then form a cable extension from East Java to Melville Island. His estimate of cost for the cable alone was £400,000 and he did not see at that time how the undertaking could be successfully floated without a subsidy of £40,000 secured for thirty years. He has seen further into it since, however, and thinks now that, without any subsidy at all, a still larger scheme may be carried out. Mr. Fraser's special section is the land line from Port Darwin to Burke Town which Captain Osborne at first intended to leave to local enterprise. Its inclusion now may be owing to the advantages gained by Mr. Fraser in his negotiations with the Dutch Government. Though there has been no specific intimation of the fact, he may have secured his expected concession, and with it he may have purchased this relief for Queensland from the last of her difficulties. Her ambition throughout has been to finish her local line to Burketown and be met there by foreign capitalists. They have not come precisely as Mr. Fraser anticipated for his idea was to carry the cable from Java direct to the head of the Carpentarian Gulf. The extra expense, equal to at least £200,000, and the precarious route have deterred them from adopting his favourite plan but they have made a liberal compromise with him. After landing the cable at Port Darwin, they will construct eight hundred miles of land line, which should complete the Queensland route, with the exception, of a short gap between Cardwell and Burketown. At all events the hand of Mr. Fraser is very evident in the arrangement. He must have accomplished something at the Hague or his scheme would never have been espoused so warmly by the magnates of the Telegraph Construction and Maintenance Company. Until it runs against the stumbling block of the Dutch lines at Java, the new route is the best that could have been selected. Excepting the short section in the hands of the Dutch, it will be entirely under English control and management. It is stated in the prospectus that there will be but one directorate though various proprietaries will be represented by it. the third, from Suez to Aden, thence to Bombay, is now being completed for the British-Indian Company. This year the Great Eastern will return with the cable for a line from Ceylon to Singapore. It is intended to have two branches radiating from there under distinct proprietaries - one to China and the other to Australia. The China Submarine Company was expected to have been first launched but the Australian project has taken precedence of it; and though rather abruptly placed in the market, its reception has been most gratifying to the promoters. Without any mention of subsidy or guarantee and with no other attraction than a moderate estimate of the traffic likely to be secured, they had three times the number of shares applied for which had been offered. The prominence which Australian subjects enjoyed at the time can alone explain this avidity of the British capitalist for Australian investments. It affected other matters than telegraphs, as witness the high prices obtained for the December issue of South Australian bonds and the still better terms on which the balance of the Victorian five per cent loan was placed in January. The premiums on the former averaged £8 7s. 9d., — considerably the highest yet realized. Without intending to make too much of occult influences, we must direct attention to the peculiarly favourable aspect which the Northern Territory presented to the British public when these transactions were in progress. Mr. R. D. Ross had recently arrived in England after the successful accomplishment of his mission to India. The Times, suspending for a moment its peculiar sympathy with grumbling land-order-holders, had entered very heartily into the project for establishing a Remount Depot at Port Darwin. It had published a detailed and, on the whole, correct account of Mr. Ross's proposition to the Indian Governments. It had recommended the scheme in its leading columns and had even eulogized the resources of the new settlement. Soon after, the intelligence of Mr. Goyder's success in completing the survey silenced the complaints of the order holders, while the reported gold discoveries gave them something to hope for. It would have seemed too absurd for men to make a grievance of having to accept land at three and nine pence per acre which might one day turn out to be a magnificent gold-field. Port Darwin changed its aspect to the couleur de rose and Australia grew in favour with investors. The treble subscription for British Australian Telegraph shares and the enhanced premiums for Australian debentures were an exceedingly natural and also a very agreeable consequence. A short while ago, we had occasion to refer to Mr. Ross's efforts in the London Press to promote the interests of Port Darwin. One of them was directed to this very question of telegraph communication and it foreshadowed such a scheme as has since been initiated. The result however, did not happen exactly as we anticipated. It did not assist the project then mooted - Mr. Gisborne's Anglo-Australian and China Telegraph Company— but it evoked a powerful substitute. Shortly afterward, the prospectus was issued by the British-Australian Telegraph Company, promoted by Captain Osborne. Though Mr. Gisborne has been very provokingly cut out by his more influential rival, he and his friends are not extinguished. We have private information that they will prosecute their scheme — possibly in a modified form. It is not surprising that they should have been outdone by Captain Osborne for he has the advantage of them both as to route and expense. Their cable was to have been carried from Java direct to Burke Town and would have taken the whole of the Australian traffic through Queensland. For less cost, the British Australian Company will reach Burke Town via Port Darwin and afford a more convenient connection to the Southern colonies. 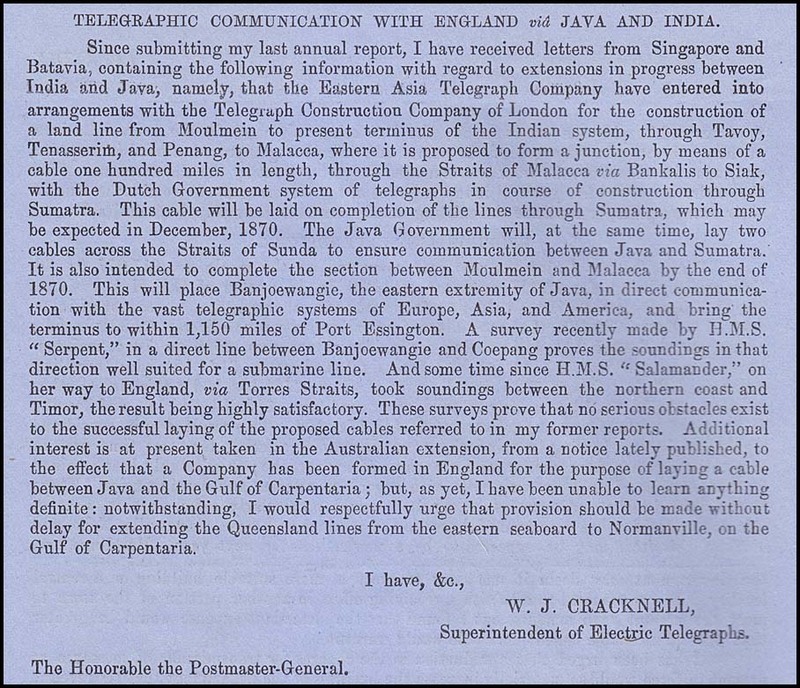 The establishment of a telegraph depot at Port Darwin interests Victoria and New South Wales indirectly and, with them, we must shortly discuss the question of how it is to be turned to the best account".